An aspiring writer returns to his native village, where his father’s debts catch up to him. The third film set in Anatolia, Turkey after ONCE UPON A TIME IN ANATOLIA and WINTER SLEEP, THE WILD PEAR TREE is another engrossing and rewarding drama to watch despite its 3-hour running time. As in all of Ceylon’s films, the drama deals with an individual as he contemplates existence in a rural setting. Because Ceylon is able to connect his protagonist with his audience through film, his films are tremendously satisfying, this film having the best rating on Rotten Tomatoes for a film screened at Cannes this year. THE WILD PEAR TREE is also Turkey’s entry for the Best Foreign Film Oscar for 2018. The film opens with the return after graduation from college of one young Siman (Aydın Doğu Demirkol) to his family farm. Ceylon is clear to show that he is one in love with Turkey as the camera proudly pans the landscape of the rural countryside and the beauty of the port. Sinan is passionate about literature and has always wanted to be a writer. Returning to the village where he was born, he pours heart and soul into scraping together the money he needs to be published, but his father, Idris’s (Murat Cecir) debts catch up with him. The segment with Siman working unsuccessfully to dig a well on the farm so that the father could till the land is one that demonstrates both the problems a family faces while working together as well as the harshness of farming as an occupation. Siman’s goals and ambition in life are put into question when he later meets a young girl. He confesses that the villagers are simple peasants and she remarks that he would think little of her as she has aims of staying in the village and getting married, settling down. One wonders if the segment in which the idealistic Siman looks into getting his work published is autobiographical. Director Ceylon probably faced the same resistance when he wanted his films made. It is a question of the idealistic vs the realistic. Siman’s possible publisher is reluctant having seen many similar cases before, one of which includes himself wanting to write as well. This part ends the second half of the film. It is a bit slow and would likely be more interesting to artists having to go throughout the same ordeals as Siman in the story. Ceylon has a religious debate that goes for a while at the 2/3 mark of the film. The debate that is also applicable to other religions, about changes in the Koran might either come across as too heavy, too distant or un-relatable. Even the imam confesses at the end of the debate: “There is no end to this discussion.” But Ceylon allow the debate to go on and on with little conclusion. 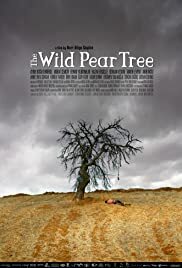 THE WILD PEAR TREE, as in the other Ceylon films a heavy watch – a case of one having to work in order to reap the rewards.